Can a feature cross truly enable a model to fit nonlinear data? To find out, try this exercise. Click on a line that connects FEATURES to OUTPUT. An input form will appear. Type a floating-point value into that input form. Note that the interface for this exercise does not contain a Step button. That's because this exercise does not iteratively train a model. Rather, you will manually enter the "final" weights for the model. Click the dropdown arrow for the answer. 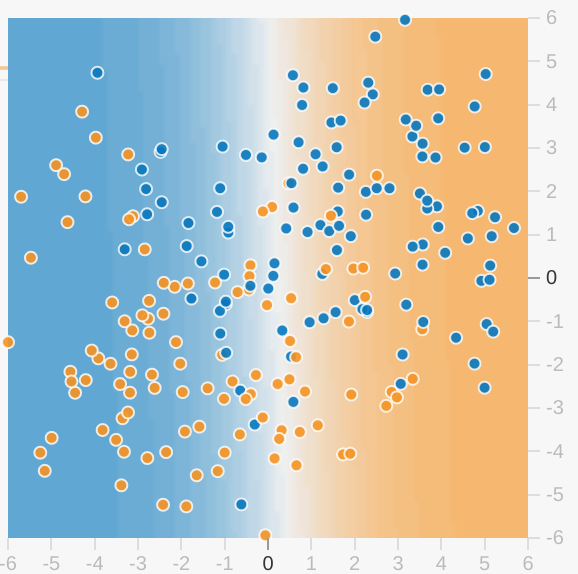 If you enter a negative value for the feature cross, the model will separate the blue dots from the orange dots but the predictions will be completely wrong. That is, the model will predict orange for the blue dots, and blue for the orange dots. Now let's play with some advanced feature cross combinations. The data set in this Playground exercise looks a bit like a noisy bullseye from a game of darts, with the blue dots in the middle and the orange dots in an outer ring. Click the dropdown arrow for an explanation of model visualization. Each axis represents a specific feature. In the case of spam vs. not spam, the features could be the word count and the number of recipients of the email. Note: Appropriate axis values will depend on feature data. The axis values shown above would not make sense for word count or number of recipients, as neither can be negative. Each dot plots the feature values for one example of the data, such as an email. The color of the dot represents the class that the example belongs to. For example, the blue dots can represent non-spam emails while the orange dots can represent spam emails. The background color represents the model's prediction of where examples of that color should be found. A blue background around a blue dot means that the model is correctly predicting that example. Conversely, an orange background around a blue dot means that the model is incorrectly predicting that example. Task 1: Run this linear model as given. Spend a minute or two (but no longer) trying different learning rate settings to see if you can find any improvements. Can a linear model produce effective results for this data set? Task 2: Now try adding in cross-product features, such as x1x2, trying to optimize performance. What is the best performance that you can get? Task 3: When you have a good model, examine the model output surface (shown by the background color). Does it look like a linear model? How would you describe the model? Click the dropdown arrow for the answer to Task 1. No. A linear model cannot effectively model this data set. Reducing the learning rate reduces loss, but loss still converges at an unacceptably high value. Click the dropdown arrow for an answer to Task 2. Reducing the Learning rate, perhaps to 0.001. Click the dropdown arrow for an answer to Task 3. The model output surface does not look like a linear model. Rather, it looks elliptical.